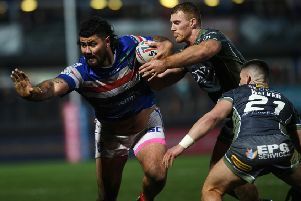 Bill Tupou completed an 11-minute hat-trick as Wakefield Trinity fought back to beat Super League champions Wigan Warriors. Wigan opened up a 20-0 lead in the opening 20 minutes only for Wakefield to fight back and claim a 42-30 victory. James Worthington, Lewis Tierney, Liam Marshall and Tommy Leuluai crossed the whitewash in Warriors’ scintillating start. But Tupou started the fightback with two quick-fire scores and Mason Caton-Brown also touched-down before Tupou completed his hat-trick. Liam Finn’s four conversions put the visitors 22-20 up at the break. Danny Kirmond’s try and Finn’s goal extended Trinity’s buffer and Finn made it 30-20 with a penalty on 52 minutes. Anthony England continued Wakefield’s onslaught with a Finn-improved try and although Williams stemmed the flow with his second on the hour, Jacob Miller stretched over, Finn adding the goal, to put the visitors 42-26 ahead with 10 minutes left. Marshall’s second of the game was a consolation for the hosts as Wakefield celebrated their first victory at Wigan in over eight years.